It’s become one of the president’s favorite talking points. But it’s wrong on many levels. We have covered this claim repeatedly in our database of Trump’s false or misleading claims. But having obtained an extensive data set on the tariff revenue, we wanted to explore this issue in more depth for our readers, given that the president offered a version of this statement three times just in the past week. 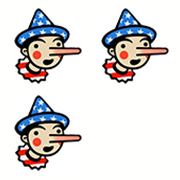 The president has claimed that the tariffs he has imposed, especially on China, have resulted in a bounty for the U.S. government — “billions of dollars.” And he has claimed that it’s been costly for China — that it is paying a lot of money to the United States. Some context: “billions” may mean something to the president — who claims he’s worth $10 billion  — but it is chump change for nations. In fiscal 2019, federal revenue is expected to exceed $3.4 trillion, so “billions” is the equivalent of fractions of pennies. (We will offer the details below). China, meanwhile, projected spending $3.3 trillion under its government budget in 2018. So $10 billion wouldn’t mean much to China, either. So, ultimately, Americans are footing the bill for Trump’s tariffs, not the Chinese. The president is fooling himself if he thinks otherwise. Okay, but how much money have the tariffs actually raised? In our Trump claims database, we had been crudely comparing year-over-year customs data in the Monthly Treasury statement, with the difference indicating the impact of additional tariffs. But now we have obtained a very detailed breakdown of the tariff revenue via an anti-tariff campaign called Tariffs Hurt the Heartland. The group has an obvious bias on the issue, but the numbers seem solid. The data is current as of November, as some numbers have been delayed because of the lengthy government shutdown. Before Trump began imposing tariffs, products from China faced a little under $400 million in tariffs a month. Starting in July, the tariffs just about doubled, reaching $2.6 billion in October and $2.5 billion in November. So subtracting from the baseline of $400 million, that adds up to an extra $6.1 billion in tariffs. Assuming the same trend line, it would be a little over $8 billion through December. Aluminum tariffs went from a base of about $12 million a month to a high of $150 million in July, for an increase of $789 million through November. Through December, that would be about $910 million. Steel tariffs were virtually zero before Trump took action early in 2018 and reached a high of $475 million in July. In all, steel tariffs add up to almost $2.8 billion through November. Through December, the trend line indicates $3.2 billion. So, in all, Trump can claim a total of about $12 billion in tariffs through December, with $8 billion of that on goods from China. So that adds up to “billions,” even though it’s no great gift to the Treasury — and as we noted, it’s being paid by Americans. That $12 billion is less than a rounding error in a $3.4 trillion revenue stream. But it’s also a net loser. As Benn Steil and Benjamin Della Rocca first noted in a brief for the Council on Foreign Relations, the China tariff revenue has been completely swamped by payments the government has made to farmers who lost business because China stopped buying U.S. soybeans, hogs, cotton and other products in response. As of December, the government said it will cut nearly $9.6 billion in checks, including $7.3 billion to soybean farmers, $580 million to pork farmers and $554 million to cotton farmers. Up to $12 billion was made available by Trump, and the Agriculture Department also plans to spend $1.2 billion on purchases of surplus food and provide $200 million for trade promotion work by ag export groups. Meanwhile, exporters have been hit hard by retaliatory tariffs, according to the Census Bureau data analyzed by Tariffs Hurt the Heartland. China imposed tariffs on more than 800 products, accounting for almost all U.S. agricultural and food exports to China, according to the Congressional Research Service. Canada and Mexico are each targeting about 20 U.S. food and agricultural products, while the European Union and Turkey have each imposed retaliatory tariffs on about 40 U.S. agricultural and food products. Bankruptcies in the Midwest — the Farm Belt — are at the highest level in a decades, according to the Wall Street Journal. As of November, these U.S. exports have declined by $4.1 billion, or 37 percent, from the previous year, even as exports of products not subject to those tariffs have continued to grow, indicating that unrelated trends, such as a strong dollar, are unlikely to explain the decline in exports. Trump can claim that through December, his tariffs have raised about $12 billion, of which $8 billion stem from tariffs on Chinese products. But his statements go off the rails when he claims that (a) China is paying these tariffs and (b) this is a gain for the Treasury. Tariffs are paid by importers, so this is a tax paid by Americans, not China. And given that Trump has authorized payments of up to $12 billion to help farmers harmed by retaliation by China, the tariffs so far have been a net loser for the Treasury.